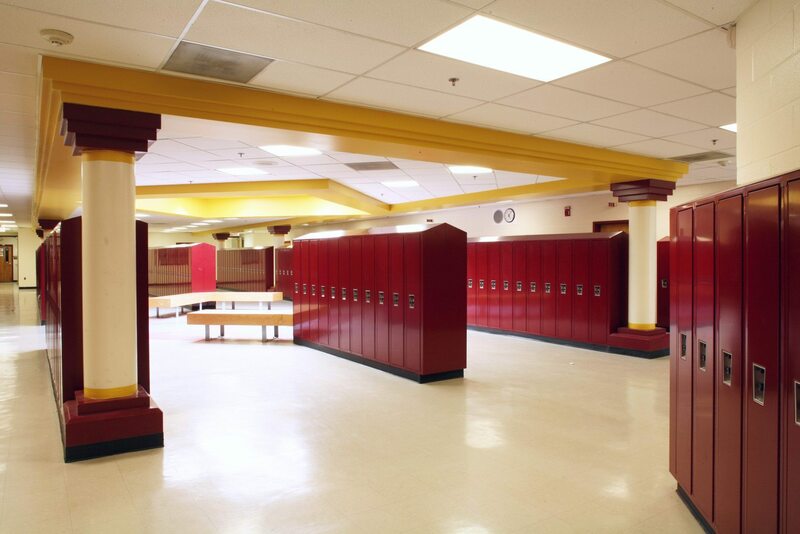 Helbing Lipp Recny Architects developed a renovation and addition project for the Jefferson County School Board, to increase the capacity of the facility and meet the requirements of a 21st century high school. The project included renovation of about 34,000 square feet of existing classroom space and construction of three additions. One addition included a new gymnasium facility at the rear of the school facility; it has seating for 2,000 surrounding a 94’ x 50’ basketball court, locker rooms, rest rooms, and concession areas. The second addition provided a new music facility, with a fan shaped band room and adjacent support spaces. The shape of the band room becomes part of the new front façade of the building. The third addition completes the project. Next to the band room, this addition gives the school a new “front door” with a covered portico, and adjacent to the entrance a new media center was developed, to include seating for 150 students and the ability to lock it off from the rest of the school so it can be used after hours. The result is an updated and cohesive appearance to the facility, which the community has embraced as its own.